When students are free to pursue their interests and choose how they spend their day, there is often a feeling of empowerment. However, beyond that there can also be a feeling of comfort and control that is out of reach for many students in traditional school settings. 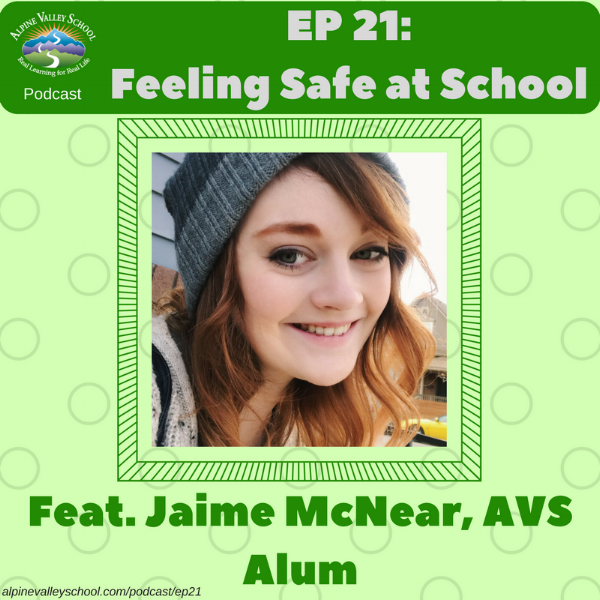 In this episode we explore the idea of safety at school with Alpine Valley School graduate Jaime McNear. She shares stories of her transition to AVS from a school for the gifted (where she experienced bullying), and learning to feel safe around people again. Jaime opens up about the power of Judicial Committee and how the ability to write up everyone (students and staff alike) helped her relate better to adults, which set her up for success when she eventually moved on to college. This episode is also available on YouTube.